??? : born in Edo at an unknown date. His father Morita Kan'ya VIII gives him the name of Morita Matakichi. 11th lunar month of 1801: Morita Kan'ya VIII and his son Morita Matakichi respectively take the names of Bandô Yasosuke I and Morita Kan'ya IX at the Kawarasakiza, playing in the drama "Ume ni Suisen Iro no Udezuku"; the new Kan'ya becomes the official zamoto of the closed Moritaza. 1st lunar month of 1805: Kan'ya goes to Ôsaka and plays at the Kado no Shibai the roles of Araguma Tarô and Kudô Saemon Suketsune in the new year drama "Matta Shibaraku Imairi Sugata". 4th lunar month of 1805: Kan'ya plays in the same theater the role of Hôjô Tokimasa in the drama "Ômi Genji Senjin Yakata". 5th lunar month of 1808: the Moritaza, which was closed since 1800, reopens. 6th lunar month of 1809: premiere at the Moritaza of Katsu Hyôzô I's drama "Okuni Gozen Keshô no Sugatami"; Kan'ya plays the roles of Nagoya Kosanza, Kanaya no Kingorô and Ashikaga Yoshimasa [casting]. 22nd day of the 2nd lunar month of 1814: his father Bandô Yasosuke I dies. 3rd lunar month of 1814: Kan'ya plays the Moritaza the role of Koganosuke in the drama "Imoseyama Onna Teikin". 11th lunar month of 1814: Kan'ya produces at the Moritaza the kaomise drama "Fuyu Botan Yuki no Jinmaku". The theater goes baknrupt and the performances stop. 11th lunar month of 1814 ~ 10th lunar month of 1817: the Moritaza goes bankrupt; Kan'ya gives his licence for Kabuki performances to Kawarasaki Gonnosuke V, the manager of the Kawarasakiza, the hikae yagura of the Moritaza. Fall 1816: Kan'ya goes to Ôsaka and plays in the 11th lunar month at the Naka no Shibai the role of Shigehira in the drama "Gosho Zakura Horikawa no Youchi". 11th lunar month of 1817: the Moritaza reopens; the opening program including the great dance-drama "Tsumoru Koi Yuki no Seki no To", starring Ichikawa Omezô I, Bandô Matajûrô, Kan'ya and Azuma Tôzô IV in the roles of Kuronushi, Munesada, Komachi and the spirit of the cherry tree. 7th lunar month of 1818 ~ 10th lunar month of 1822: the Moritaza goes bankrupt; Kan'ya gives his licence for Kabuki performances to Kawarasaki Gonnosuke V, the manager of the Kawarasakiza, the hikae yagura of the Moritaza. 11th lunar month of 1822: the Moritaza reopens; the opening program is also the shûmei of Iwai Shijaku I. 5th lunar month of 1823 ~ 10th lunar month of 1833: the Moritaza goes bankrupt; Kan'ya gives his licence for Kabuki performances to Kawarasaki Gonnosuke V, the manager of the Kawarasakiza, the hikae yagura of the Moritaza. 5th lunar month of 1830: Morita Kan'ya IX, who has decided to retire, and Bandô Sanpachi III respectively take the names of Bandô Yasosuke and Morita Kan'ya X. 22nd day of the 5th lunar month of 1851 : Yasosuke dies in Edo. 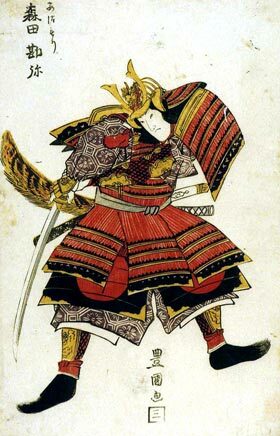 Morita Kan'ya IX was both a tachiyaku actor and the tenth manager of the Moritaza from 1808 to 1823. He had hard times to keep the family business up and running because of the heavy burden of the theater debts and went bankrupt three times during his career. The 22nd day of the 5th lunar month of the 4th year of the Kaei era was the 21st of June 1851 in the western calendar.